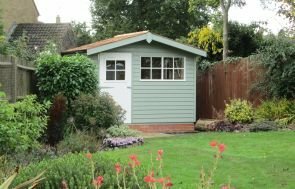 This attractive shed is our Superior: it is the highest spec shed that is available in our range, with an abundance of sizes and features to choose from. This one has been installed in our customer’s garden in Kintbury, Berkshire to use as a garden storage shed, for their lawnmower, wheel barrow and array of tools. The features that make this 2.4 x 3.6m shed stand out from your typical garden shed are the construction-grade cedar shingle tiles on the roof, the black guttering, Georgian windows, including a window in the door, and the natural looking, multi-layered, opaque paint system (Valtti) in the colour, Lizard. Along with the slow grown FSC® certified Scandinavian Redwood that is used to make our quality garden buildings, the extra features make this shed really stand out from the crowd. I should like to take this opportunity to thank you for the very nice Superior Shed that was delivered to me on Friday 23rd Jan. I should also like to thank the two fitters for their excellent work. I am looking forward to installing my model trains. A storage shed doesn’t have to be a simple affair, after all it’s going to be in your garden for a very long time and we think it’s good to have something nice to look at. If you would like to know more about our high quality Garden Sheds, you can come and see them for yourself at any one of our six Show Centres across the country. They are in Norfolk (our factory HQ), Berkshire, East Sussex, Nottinghamshire, Oxfordshire or Surrey. If you can’t get to any of these locations though, you can always either call us on 01760 444229 or Contact Us online and one of our helpful team will be able to help answer any questions you have.